Blog - Autumn Style with Royal Crown Derby. Autumn Style with Royal Crown Derby. Autumn is upon us, the leaves have already started to change colour bringing beautiful hues of rustic orange, mustard yellow and various shades of red, the nights are drawing in and what better way to see in one of the cosiest of seasons to indulge with a carefully selected collection of luxury fine bone china tableware to add a touch of autumnal style to your home. Autumn is the perfect season for colour with leaves slowly changing from vibrant green tones to stunning rich shades of orange, yellow and brown. Berries are abundant from late summer harvest adding rich opulent shades of red and blue. 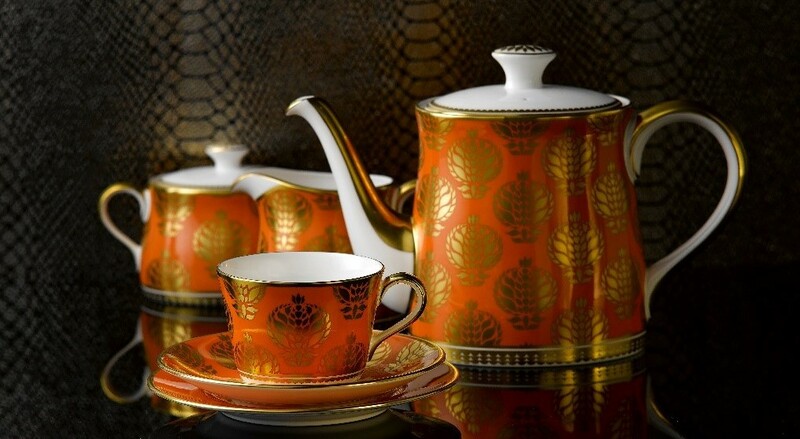 Royal Crown Derby’s Bristol Belle Burnt Orange tableware pattern is a perfect way to bring this seasons colour to your table inspired by the falling leaves with a vibrant orange hue contrasting stunningly edged in 22 carat gold in a quintessentially British design. View Bristol Belle Burnt Orange Tableware here. Rich red berry tones and deep cobalt blue shades makes the Old Imari Solid Gold Band design a perfect addition to the home this season. The 19th century archival design is an ever popular striking pattern embellished in 22 carat gold adding an opulent touch to this classic design. A perfect way to add a touch of luxury to the table this Autumn. View Old Imari Solid Gold Band Tableware here. Flora & Fauna in Autumn. Darker tones overtake the bright hues of summer in the latter part of the year in nature, but this does not make the season any less scenic. Royal Crown Derby’s Autumn Gold Seasonal Accent Plate takes inspiration from this stunning season featuring deep shades of red and light green inspired by flora and fauna which blossoms to life during this time of year. Finished in luxurious 22 carat gold makes it a wonderful giftware piece to adorn any table or as a special gift. View the Autumn Gold Seasonal Accent Plate here. The stunning deep red palette of the Imari Accent Golden Peony Coffee Can and Stand creates a beautiful autumnal design finished in 22 carat gold making it a perfect treat this season. View the Imari Golden Peony Coffee Can and Stand here.